Sending them off to college is an exciting time. You will no doubt have a list of items they will need to furnish their dorm room. The last thing on your mind is what about water? Since water is essential to life, it should be on the top of every back to school list! A filtered water bottle is great for kids from elementary school to college. Multipure’s Wriggle is perfect to take fresh, filtered, safe water anywhere. Stop sending them with bottled water. Bottled water may be contaminated, the bottles end up in land fills and they are just expensive. A filtered water bottle is more economical and insured that the water is filtered of contaminants. A water pitcher can sit in the fridge for cold, filtered water. If the dorm does not have a kitchen sink, it will have a small fridge. The Cerra Water Pitcher will filter and enhance water for drinking. Remove contaminants and add vital ionizing elements, perfect for the student who plays sports. A portable water filtration system is perfect for a dorm room. The Multipure Aquamini is designed to fit in small spaces. Dorm rooms that have kitchens should include a water filter. Going off to college in anther state or even another country brings up many safety issues. Make sure the water your student is drinking is filtered and healthy. Most municipal water supplies contain chlorine. While you may have a filter for drinking water, filtering shower water is just one more thing you can do to keep them safe while they are away from home. Relaxing in a nice hot bath after a strenuous work out is even better with a bath filter. Just drop a bath ball into a tub of water and you won’t be soaking in chlorine. Water is life essential. Sending the kids off to school with the proper water filtration will take that fear out of the equation. A water filter will give you peace of mind that not only are they drinking water, it will be safe water. There may be contaminants in the water at the dorm that are not in home water. Bottled water is ok in a pinch, but a filtered water bottle makes more sense and costs less. Make sure they are safe no matter where they are. 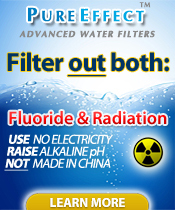 Send them back to school with a water filter. Back To School, How is the Water in Your Childrens School? Do you know what your kids are really drinking? Summer vacation is almost over. Parents and grand parents all over are getting ready to send their kids off to school. The back to school lists are made, we watch for the big sales. Our children are supposed to be safe at school. Improvements are being made in the lunch room, to insure they get good nutrition, teachers are honing their skills to give the best education, but are they missing something that could be undermining the education that our children receive? MSNBC reports that many schools across the country have water contaminated with lead, pesticides and many other toxins. The Federal Government is really dropping the ball here! Most contaminants found in our schools have been proven to cause learning disabilities. Some states require households with children to have their water tested to insure it is safe, but do not regulate the water supply in public school systems. Check the map here and see what the results were in your state. So, what can we do to make sure our children are not drinking poison when they go back to school? There are several alternatives to letting our children drink water at school. The first one that may come to mind is sending them with bottled water, but bottled water is not at all eco friendly, and it can be just as contaminated as the school water. Another option is to purchase a great water filter to insure there are no water contaminants effecting your child’s learning in your home water and use a reusable, BPA free water bottle to send your water to school with them. This may not be enough to get them through the day and they will drink the contaminated school water anyways. There is a new tool that parents can use to make sure the kids are drinking safe water, anywhere they go. The Multipure wriggle. The wriggle is a filtered, reusable, water bottle. Using a personal water filter, the kids can fill it up an you can feel confident that the water they drink anywhere, is as safe as it can be. What if we could all find a use for a lot of plastic bottles? Since it seems we just can’t stop being pigs and just tossing our plastic bottles in the trash, other countries are finding ways to use some of our waste. What will they think of next! Imagine how many boats you could construct with the tons of plastic bottles that are thrown away every day. Why not build boats with them? Simple ones or very high tech. The Plastiki can be seen at plastiki.com. Follow the voyage of reused plastic bottles. I highly recommend taking the virtual tour. The Hi-Fi version, if your computer will handle it, is pretty cool. The low-fi is good too. The site does take a while to load, but worth the time. What if we could make use of all the bottles that get dumped every day? Other countries, including Africa are finding ways to reuse a lot of plastic bottles! Inhabitat.com has a great post about Asia’s first plastic bottle school. read it here, and be sure to check out the photo show! Amazing! These are just a few examples of what can be done on a large scale. While some are finding uses for our garbage, we are giving solutions to stop using so many plastic bottles. Between building schools, and getting back to drinking our own tap water. We can all do a part to stop filling land fills and water ways with our trash. Did you know that any Multipure product would make a perfect gift for that Dad or Grad on your list? Any Dad or Grad would love to have a Multipure water filter for a gift. First, the wriggle, portable, reusable filtered water bottle. Who would like one of these? The traveler who doesn’t want to add more plastic to land fills. The eco conscious, for the same reasons. The dieter, who is drinking more water to stay healthy. Any Dad or Grad who drinks water, would simply love one of these personal water filters. Next we have any of our home water filters. For the Dad on your list, show him how much you care by giving the gift of safe drinking water. For the Grad, chances are, they are also getting a new home. What better gift than healthy water for their new digs. The Aquacomplete is our Reverse Osmosis (RO) system with a multi-stage filtration design. It features three (3) pre-filters, an RO membrane, and an Aquaversa post filter. The multi-stage filtration reduces all minerals, as well as, the contaminants reduced by the Aquaversa. This model includes a special 3-tube air gap faucet that requires a 0.5” hole in the countertop or sink for installation. Because it connects to both the water source and the drain, we recommend the use of a professional plumber to install the Aquacomplete. The Aquaperform is NSF certified to remove arsenic, as well as many other contaminants. The Multipure Aquaperform not only reduces the wide range of contaminants screened by standard Multipure filters, but also reduces the presence of Arsenic in the drinking water. It is a high performance filter unit in a durable, stainless-steel casing. A Multipure water filter in any form would be the perfect gift for Dad or Grad. Water is essential to life, give the gift of Life Essential water. Need a unique, original Mothers Day gift for that special Mom in your life for Mothers Day? Multipure has a perfect gift for any Mom on your list! Whether she is an avid gardener, or just likes to be healthy, the perfect gift is just a click away. A Multipure quality home water filter is the Mothers Day gift that keeps on giving. Give Mom the gift of healthy, uncontaminated water, right from her own tap. We have many styles to choose from. One is sure to make Mom’s Day! Want to make that gift last longer? Why not get the best deal Multipure has to offer? A FilterMania package will last 10 wonderful years! For the health conscious Mom, give some Multipure Vitalic. For this Mothers Day, Multipure Vitalic water vitalizer continues Multipure’s tradition of better water for a better life. Multipure Vitalic is a nutrition and flavor booster that complements Multipure water, promoting health and wellness. Multipure Vitalic is a premier vitamin health booster and the perfect complement to Multipure filtered water. It is a water vitalizer, designed to turn your water into an energizing, invigorating, empowering glass of liquid health. Each scoop of Multipure Vitalic is good for one 8 oz. glass of water. For best results, use with Multipure filtered water. Does Mom like to travel? Does she take a bottle of water with her where ever she goes? Well the Multipure wriggle is the perfect gift idea. The wriggle Portable Filtered Water Bottle is Multipure’s revolutionary new way to obtain cleaner, more healthful water wherever you are. Simply fill the wriggle with any tap water, and with every squeeze and every sip, the wriggle’s proprietary filter reduces contaminants of both aesthetic and health concern. It comes in 2 delightful colors that Mom is sure to love. For the Mom who loves to garden, we have the Multipure AquaGrow. Mom’s veggies and flowers will be beautiful and healthful. With the new Aquagrow Garden Filter, Multipure provides the benefits of cleaner, more healthful water to your yard and garden. By connecting the remarkable Aquagrow inline filter to your existing garden hose, you can provide your lawn, your garden, and any of your outdoor plant life with beneficial dechlorinated water. The Aquagrow provides the water that your plants need to truly thrive. Better yet, why not get a Multipure quality home water filter and an AquaGrow? We’re offering our exciting Aquagrow yard-and-garden dechlorinator at 50% off* to customers that purchase any Multipure Drinking Water System! A savings of over $32, the Aquagrow easily connects in-line to your existing garden hose to reduce the levels of harmful chlorine in your outdoor water. Give your plants the healthful water they need to grow and thrive! Make Mom happy and healthy this Mothers Day. Give a Mothers Day gift of life essential, healthy water. Multipure has a perfect gift for any Mom on your list. Happy Mothers Day to all the Mom’s out there! Make it happy and healthy! Bottled Water Sales are Dropping! The economy is still struggling. More consumers are cutting corners. Bottled water is off the shopping list of many consumers. This is great news! This means we are winning the fight against bottled water! There is room for more improvement, but this is definitely a great start! Food and Water Watch reports a 12.6 percent drop in sales! Nestle has to work harder to gain back consumer confidence. Watch out for increasingly deceitful advertising from the Nestle, Pure Life brand. As many consumers in the United States and Europe are dropping bottled water, the industry is beginning to see a decline in sales. In fact, between 2007 and 2010, Nestlé Waters, the biggest water bottler in the world, saw its total sales drop 12.6 percent. Today, Nestlé appears to have developed new strategies to combat this challenging sales climate, which center around its Pure Life brand. Unfortunately, while the brand has been profitable, these tactics do not bode well for public water in the United States or abroad. Nestlé has shifted the focus of its advertising dollars in the United States to its new Pure Life brand. Between 2004 and 2009, spending on Pure Life advertising increased by more than 3000 percent; the company’s nearly $9.7 million expenditure on the brand in 2009 was more than any other bottled water company spent on a leading domestic brand, and more than Nestlé’s next five spring water brands combined. While Nestlé’s global water division’s sales are falling in Europe, the United States and Canada, they are growing rapidly in the “emerging markets” that Nestlé is targeting in the rest of the word. In 2010, Nestlé’s sales of bottled water in these “other regions” increased by 25 percent over its 2009 sales in these areas. Pure Life bottles municipal tap water rather than spring water, which can help the company avoid the costly conflicts over water access and labeling that have plagued its spring water operations in the past, allowing it instead to vie with its main competitors, PepsiCo and Coca-Cola, on price. The company focuses its messaging on the health benefits of bottled water, especially compared to sugary soft drinks, which improves the image of its product and helps it appeal to parents and teachers who are concerned about their children’s health. It also specifically targets Hispanic immigrants in the United States and “emerging markets” in developing nations abroad — consumers who are accustomed to inadequate water infrastructure and therefore less inclined to drink from the tap because of safety concerns. Educate yourself. Read the complete report here. StopCorproateAbuse.org is reporting that the ad campaigns in the bottled water industry have not gone as planned. The still struggling economy and environmental awareness are taking consumers back to their tap. More consumers are choosing to drink tap water over bottled water not only to save money, but to also do their part for the environment. Bottled water is wasteful and expensive. You go to the store, heft a case or two into your cart. Haul that cart to your car, put it in your trunk. Then you get home and have to lug it around one more time. Why torture yourself? Take back your tap. Save money, and the environment. If you are still drinking bottled water because you feel your tap water is unsafe, get it tested. Then, the solution could be as simple as purchasing a quality home water filter. Although there is an initial cost, the savings are felt quickly. The wriggle was a gift for the stars at the Oscars. It will also be a gift for a couple other award shows. Kenton Jones, one of our fearless leaders at Multipure, was on the MORE TV show in Las Vegas on April 11th, 2012! The new wriggle filtered water bottle will reduce waste, and insure the water you drink, anywhere, is safe, healthy water. Watch the video! Kenton explains how great the wriggle is for travelers. This water bottle can be taken through airport security, empty, and you can fill it up once you are through the check point and enjoy life essential, healthful water, anywhere you go! Did you know the Multipure new wriggle bottle removes pesticides? The Multipure wriggle filtered water bottle is the only filtered water bottle certified by NSF to remove not only chlorine, but Atrazine and Lindane as well. Once again, Multipure is leading the way to better water anywhere, anytime you need it. Now you may think these pesticides are no big deal, but do you really know what they are, where they come from and how they could get into your water? The EPA has information on both of these toxic pesticides. You should read it. You really need to know what is in the water you drink. My BFF Laura, aka The Water Filter Lady describes some of the effects Atrazine can have if ingested. Why is NSF certification important? We like do as we say we do. You need proof. Simple as that. NSF provides the consumer proof that our product will remove what we say it will, so you can rest assured you will be drinking the healthiest water you can get. Everyone wants to drink healthy water. Multipure wriggle was even a featured gift at the Oscars! See the stars who just love Multipure!